Sustainability awards honor trailblazing chefs and food producers. Founded in Boston in 1993, Chefs Collaborative was one of the first national chef organizations to “steer the conversation around the local sustainable food movement,” explains executive director Melissa Kogut. This year marks the non-profit’s inaugural Sustainability Awards, which honor trailblazers who bring to life Chefs Collaborative’s mission of educating chefs about sustainability and building connections among chefs and food producers. Meet the winners below. 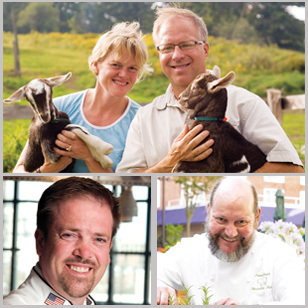 Recognizes a food producer who works with chefs and exemplifies sustainable practices. Winners Allison Hooper and Bob Reese of Vermont Butter & Cheese Creamery credit their 26-year success to the close, mutually supportive relationships they’ve developed with both chefs and farmers. For instance, Hooper and Reese have helped struggling dairies stay in business by supporting their conversion from cows to goats and then buying the milk. Honors someone who has created positive change within the food system and beyond the kitchen. Winner Chef Christopher Koetke, dean of Chicago’s Kendall College School of Culinary Arts, has made sustainability integral to every course—and shares his message with other chefs and chef-educators. “Chefs tend to focus on food, but sustainability is also about water and energy. Fixing a leaky faucet could save 100,000 gallons of water, and money too,” he says. Highlights a chef who is a mentor and a model to the culinary community through his commitment to seasonal, sustainable ingredients. Winner Chef Peter Davis of Henrietta’s Table in Cambridge, Massachusetts, started sourcing local ingredients when he started his restaurant 16 years ago, long before farm-to-table meals were popular. “There was no infrastructure and we didn’t know if people would even care,” his former sous-chef recalls. Davis got the agriculture department listings and started calling farms himself.